I've liked the style of the staff at this pharmacy since I first went to them a few years ago and ever since. They really earned bouquets forever though when they went out of their way to help me with an 'emergency' prescription repeat while away from home over Christmas. My GP practice was by contrast totally unhelpful, so no thanks to them. Alpharm, I'm yours gratefully for life! 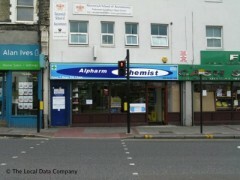 its the only late night chemist in our area, very friendly and supportive.